Long gone are the days of getting excited for the Easter Bunny and all of his spoils — in fact, we are more likely to be giving the little lapin a hand hiding his eggs instead of running amok looking for treasure. But for us big kids here's a new, definitely different, egg-citing tradition. Join American Divers for our first Underwater Easter Egg Hunt, which is the same familiar egg scenario...just amidst a wreck & coral reef. Once divers are aboard, Scubatyme will head out to a secret location. 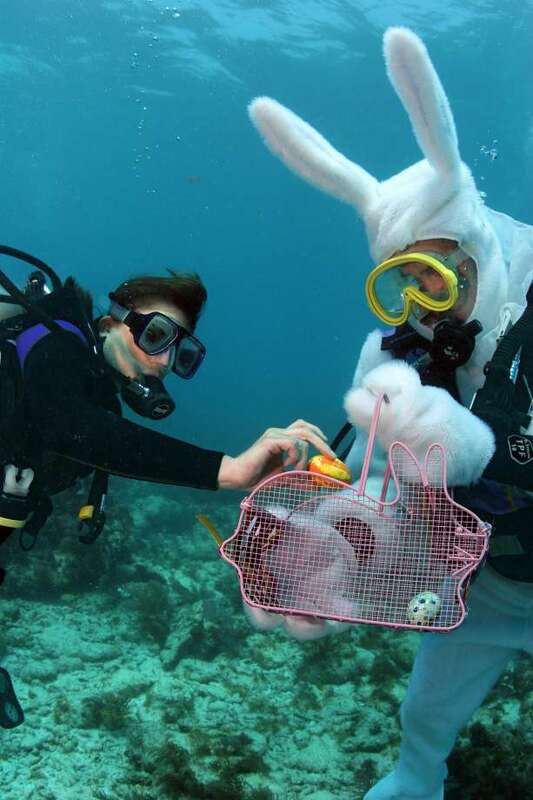 The scuba-equipped Easter bunnies, bearing an uncanny resemblance to our instructors & ADI's owner, will submerge to hide their eggs, followed soon after by the egg-hunting divers. The diver who gets back on the boat with the most eggs, will win a Tovatec UV Light! Also, somewhere in the depths, will be a special GOLDEN Easter Egg that one lucky diver can exchange for a FREE boat trip! Real eggs and non-toxic coloring used to prevent any negative ecological impact.